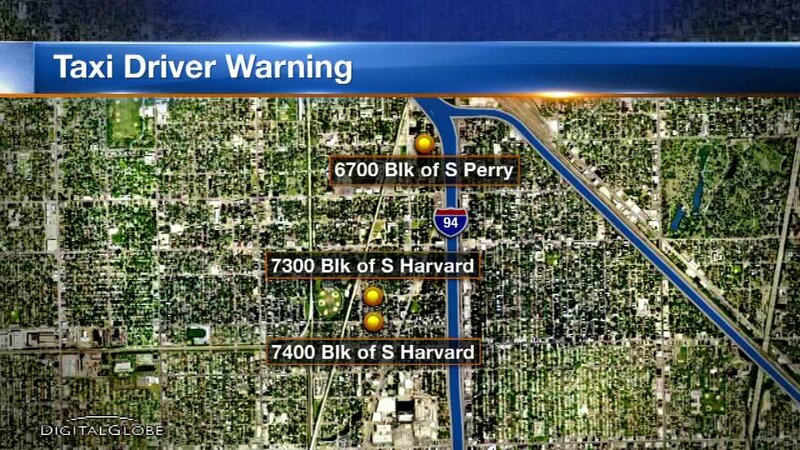 Chicago police have issued an alert for cab drivers after three robberies in the Englewood neighborhood this month. CHICAGO (WLS) -- Chicago police have issued an alert for taxi cab drivers after three robberies this month. In each case, two men took a cab from downtown to the Englewood neighborhood. While getting out of the car, one of the passengers pulls out a gun and makes off with the driver's cash. The robberies occurred at 3:50 a.m. on Oct. 7 in the 7400-block of South Harvard Avenue, at 3 a.m. on Oct. 20 in the 6700-block of South Perry Avenue and at 2:15 a.m. on Oct. 13 in the 7300-block of South Harvard Avenue. The suspects were described as African-American males, 18-25, between 5'8"-5'10" and weighting 180-220 pounds. One of the suspects was armed with a handgun. Police urge cab drivers to make sure they have working cameras inside their cars. Anyone with information is asked to contact Area South detectives at (312) 747-8273.